Can a BLM Champion Win in Missouri? What we are beginning to see is BLM move into the political space as a method of promoting the values and issues the organization supports. A new generation of politicians not tied to the 60’s Civil Tights establishment. Making the government accountable covers a lot more ground than just stopping Police violence. Go for it! Specifically, as her letter lays out, she was sick and tired of the way the Post-Dispatch leadership seemed to blame poor and struggling residents for St. Louis’s woes, attributing its problems to racially coded issues like “blight” and “graffiti.” She was sick and tired of the paper’s “thinly veiled racism and preference for the status quo past.” She wanted no part of it. Jones believes she can begin to change all that. And she detailed a plan to do so in her unsparing letter, which quickly went viral and helped infuse her candidacy with a last-minute boost of money and populist energy. As she enters the final days of her primary run, she hopes that energy will be enough to propel “the people’s candidate,” as she calls herself, one crucial step closer to the city’s highest office. Jones’s campaign, set against the backdrop of the murder of Michael Brown in nearby Ferguson, is further evidence that the movements against mass incarceration, police brutality, and entrenched racism are holding the line at the local level. Should she win, her success would offer reassurance that the progressive flame can still burn hot in City Hall, despite the reactionary white-supremacist agenda ascendant at the White House. Indeed, most grassroots progressive groups in St. Louis back Jones’s candidacy, says Kennard Williams, a community organizer with the nonprofit Missourians Organizing for Reform and Empowerment, or MORE, which is currently leading a campaign against mass incarceration, called Decarcerate STL, in the city. Jones’s record, her ideas and her rhetoric, he says, have earned her endorsements from organizations like MORE, the SEIU Missouri State Council, the St. Louis Action Council, and the Coalition of Black Trade Unionists, as well as dozens of Black Lives Matter, civil-rights, and community activists in the city. Mobilize Missouri, a statewide coalition of grassroots activists that emerged out of the Bernie Sanders campaign, endorsed her in mid-February. One sees this approach in her past work. During her innovative tenure as city treasurer, a normally staid political office, she launched a program to open college savings accounts for every kindergartner in St. Louis and seed each account with $50 drawn from parking fees. She also created an Office of Financial Empowerment, which provides free financial education and credit-counseling services. As mayor, Jones says she would expand such programs. Her agenda, though, goes far beyond that. She intends, for instance, to close once and for all the city’s notorious Workhouse, a jail that some activists have likened to a debtors’ prison. In her open letter, Jones described the facility as a “rat hole.” If she succeeds in shuttering it, she says she will funnel the budget savings to reentry programs, mental-health services, and substance-abuse centers. Jones supports the placement of social workers in the city’s police department, the establishment of a $15 minimum wage, and the creation of a Tenants Bill of Rights to help protect poor and working-class renters from predatory landlords. She plans to eliminate the St. Louis cash-bail system too. If Jones’s campaign prevails, if she beats out six other Democrats in the March 7 primary as well the inevitable Republican opponent in the April 4 general election, the Black Lives Matter movement will clearly, finally, have an unequivocal ally at City Hall. People are getting pissed at this shidt. Another example of an off-duty Police Officer shooting an unarmed suspect. Protesters in a small Texas town outside Dallas who are upset over the police killing of an unarmed Latino teenager took over a City Council meeting and ended up chasing the mayor away in a police car, WFAA reports. The protests started in Farmers Branch on Tuesday night with just a single girl holding a sign, but protesters then started rolling in via buses. The meeting ended with about 200 people chanting the name of the slain teen, Jose Cruz, and forcing Mayor Bob Phelps to adjourn the meeting. Farmers Branch police officer Ken Johnson was arrested and charged with murder for shooting and killing Cruz, who was 16, in March. Johnson was off-duty and not in uniform. Cruz was with a friend, Edgar Rodriguez, and Johnson had accused them of breaking into his car outside his home. Rodriguez, who was injured in the shooting, said Johnson never identified himself. “Thank the lord!” 107-year-old Virginia McLaurin exclaimed Tuesday morning as Washington D.C. Mayor Muriel Bowser handed her a copy of a new government-issued photo ID. Just days earlier, McLaurin revealed in an interview with The Washington Postthat after meeting and dancing with President Obama and first lady Michelle Obama in February, she had been invited to New York and Los Angeles for media interviews. There was only one problem: McLaurin didn’t have the ID she’d need to travel by plane or train, and she didn’t have the appropriate documents to get one. The Department of Motor Vehicles in D.C. said she would need documentation that proves her identity, such as a U.S. birth certificate, an unexpired passport or an unexpired military ID card, among other things. Now at the age of 107, McLaurin didn’t have any of the required documentation to get a D.C. photo ID. She once had one, but it was stolen awhile back, she told the Post. In order to obtain her birth certificate from South Carolina where where she was born, she discovered she would also need a government-issued photo ID. Bowser heard about McLaurin’s ordeal and as a result, Washington, D.C. passed a new regulation on Monday that allows the city to make exceptions for elderly residents applying for a driver’s license or photo ID. Under the new regulation, D.C. officials will now have the discretion to make exceptions for federal requirements for any D.C. resident over the age of 70, whereby they can come up with other acceptable documents. “Thank you. Thank the lord!” McLaurin said after they handed her the temporary version of the ID. She will receive the official version in the mail. He has done his homework. Is DeRay Mckesson for real? When DeRay Mckesson, a 30-year-old Black Lives Matter activist, filed at the last moment for Baltimore mayor, the city’s political establishment was well justified in asking, is this guy for real? Is he going to run a legitimate campaign, or is he going to tweet a bunch and lap up the love in the national media? Tweet a bunch, he has done, though one gets the impression that’s like saying he’s breathed a bunch in the last couple of weeks. Love in the national media? Check. Starting with a story in the New York Times and, an hour later, a beyond-fawning profile of his decision to run by a Washington Post reporter who had embedded with his proto-campaign, and then including accounts in The Atlantic, Slate, NPR, The Guardian etc., he’s been everywhere. But he’s done something else, too, and that’s issue an extensive set of policy proposals on education, economic development, public safety, health, the environment, arts and more that at least rival — and in some cases easily surpass — those from so-called mainstream candidates in their depth and scope. They are ambitious and leave gaps in some key points, particularly in terms of how the city is going to pay for them or get lawmakers in Annapolis and Washington to support them where necessary, though Mr. Mckesson is hardly the only candidate to be guilty of that sin. But what’s surprising about the platform, given how recently Mr. Mckesson has arrived on the scene, is the depth of knowledge it displays about how things have been done in this city and how they could be done differently. His ideas aren’t always the right ones or necessarily better than those proffered by other candidates, but they’re no joke either. Though Mr. Mckesson is running as an outsider, his proposals are in certain respects less radical than what other candidates are proposing. City Councilman Carl Stokes, for example, wants to require that all developments awarded incentives like a payment in lieu of taxes or tax increment financing include a community benefits agreement. Mr. Mckesson, by contrast, wants to encourage such agreements, not require them, while “rigorously” evaluating TIFs and PILOTs to ensure they are necessary and that their costs and benefits are clearly spelled out. He notes the limitations presented by the city-state co-appointment of city school board members, but unlike businessman David Warnock, he doesn’t call a hybrid elected/appointed board, nor full mayoral control of the schools, asstate Sen. Catherine Pugh suggests. Mr. Mckesson wants a $15 minimum wage — but on the state level, not just in the city. As might be expected based on his activism since the death of Michael Brown in Ferguson, Mo., Mr. Mckesson goes farther than other candidates in some of his ideas for police accountability. For example, he advocates eliminating the Law Enforcement Officers Bill of Rights altogether — a goal that is unnecessary and probably counter-productive, in that it could foreclose the possibility of meaningful reforms. But in other respects, he doesn’t. Like several other candidates, Mr. Mckesson advocates for beefing up Baltimore’s Civilian Police Review Board, but he does not go so far as Councilman Nick Mosby to propose making seats on it elected positions. Mr. Mckesson wants to decriminalize certain nuisance crimes like spitting and open-container violations, and to shift the war on drugs to one centered on public health principles rather than criminal justice. But he doesn’t suggest ending arrests for simple possession of marijuana, as attorney Elizabeth Embry does. Mckesson, 30, a Baltimore native and former public school administrator here and in Minnesota, is part of a team called Campaign Zero, which seeks to end police killings in America. The group wants to end “broken windows” policing, increase community oversight of police and limit use of force, among other goals. Dixon, the front-runner in the Democratic primary, said Wednesday she had not heard of Mckesson. She noted there are less than three months to go until the election, and said she wouldn’t be distracted. 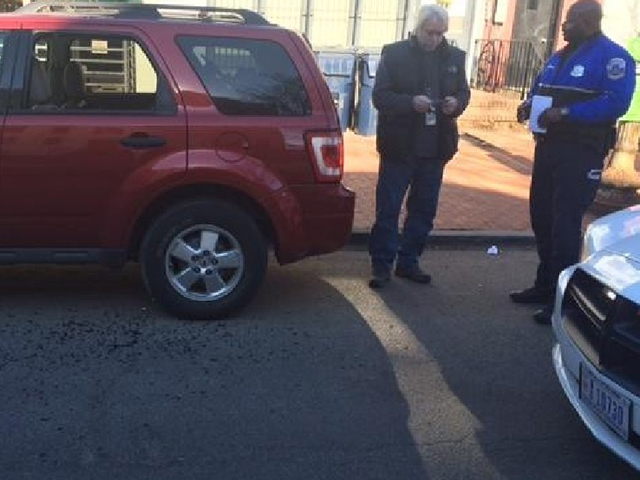 Washington, D.C. ABC affiliate WJLAsays one of its news cars was broken into while the crew was at a press conference where DC Mayor Muriel Bowser and police chief Cathy Lanier were talking about a Task Force designed to fight robberies. Tschida said the crime happened within view of where the mayor and chief were speaking, approximately 100 feet away. Posted by btx3 on January 7, 2016 in Nawwwwww!